Cigars and whisky were meant to be together, and Forty Creek cigars are a perfect marriage of the two by Ted's Made By Hand. 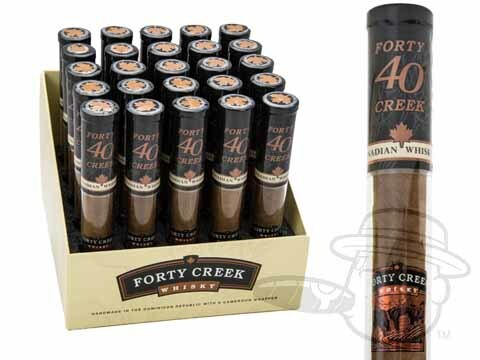 These are handmade Dominican cigars infused with Forty Creek Barrel Select Whisky, one of the only independently distilled Canadian whiskies in the world. Forty Creek cigars are nestled in a buttery Cameroon wrapper, reinforced with a USA Connecticut binder, and filled with rich Dominican tobacco. The tasting notes of the cigar; pepper, butter, and cedar; mesh well with the barrel-aged character of the whisky, which imparts notes of fruit, nuts, and spice. Forty Creek Barrel Select is distilled in small batches in an old-fashioned copper pot still and aged in white oak barrels. A selection of light, medium and heavy char barrels create a richness and toasted earthiness in the spirit. Finally, the whisky is aged in vintage sherry casks for a subtle complexity. Say goodbye to short-filler, chemically flavored cigars; Ted's Made By Hand is leading the way for infused cigars with a perfect balance of quality tobacco and flavorful infusions.